Apple's AirPods are technically brilliant - but we're not so keen on what they look like. We originally reviewed the AirPods back in December. So having used them for a few months, what do we think now? While you’re not replicating the sound from a decent pair of over-ears (obviously), they are the best sounding earphones we’ve tested that don’t need you to make a seal with a foam or rubber tip. They connect seamlessly – they are WAY better than our experience with the Beats Solo 3 Wireless – though not the Beats X - which also feature Apple’s W1 chip. They’re very comfortable and, while they’re most useful on the move, they’re also great at home. When you’re doing stuff (like chores) over-ear headphones can often get in the way or seem cumbersome. There’s none of that with the AirPods. They also don’t fall out. Unless you remove them, they generally do stay in your ears and are quite secure. Naturally that won’t be the case for every ear shape and if you haven’t liked Apple’s EarPods in the past these probably won’t change your mind. They’re also good individually for use as an earpiece if you’re awaiting or making a call; they have none of the intrusiveness of old school Bluetooth headsets. Presumably in order to deter false inputs, the mode of touch control is a double-tap. By default this invokes Siri, although you can configure the double-tap to play/pause or disable it. Settings on iOS and the Bluetooth pane in macOS are you can customise how the AirPods behave when you double tap. There is one main issue with the AirPods. This is really surprising for an Apple innovation but we’ve got to say it – they don’t look great when on. They don’t have a very premium look simply because of their resemblance to earlier, inexpensive Apple headphones, namely Apple’s EarPods. They hang down a long way and, basically, we kept catching people looking at us. Partly that’s curiosity, of course, but we couldn’t shake the feeling it was because they look so damn weird. There’s also an argument that changing the look of them would mark them apart from the EarPods, not at all the pinnacle of sound quality (though the EarPods were light years better than the original iPod and iPhone headphones). But we think a simple colour change would have done the trick - making them grey would have made them stand out a LOT less. Let’s get onto more good stuff; in contrast to EarPods, the sound from the AirPods is clean and crisp and volume doesn’t need to be cranked up to get something beefy – for many environments 50-75 percent volume is sufficient. In fact, listening on half volume is a pleasant experience. You do get quite a bit of background noise thanks to the lack of seal. These aren’t meant for audio perfection but for the combination of music, calls and using Siri. And it turns out that combo is actually rather compelling. Much like the ‘all-day’ neckbands that are sweeping the headphone market at the moment, the AirPods can also be used extensively during the day with around five hours of battery life. We have run out a couple of times when they weren’t fully charged initially and then we’ve used them for a long commute and then for a few times during the day. Our colleagues at MacFormat reckon the AirPods use around 17 per cent of the battery capacity per hour. In the box you get the AirPods in their charging case and a lightning cable for charging the case. The box is a little thing of wonder, not least because it charges the headphones as you store them. A little LED inside the lid lets you know when they are charging. Better still, opening the lid will immediately connect the AirPods to your iOS device so they’re ready to be used. If you want to use them with an Android or other device you can do that too, as there’s a pairing button on the back of the case. You're also able to see on screen the current battery state of all three batteries as well as whether one or both are charging. Once the AirPods are paired with your phone, they will auto connect with another device like your Apple Watch Series 2 via iCloud. We’ve used them to listen to music on the Apple Watch during a 45 minute run and they were the perfect companions and didn’t threaten to fall out once. They aren’t fitness headphones per se however and are no substitute for them – sweat is the enemy of ear buds and will surely have an effect over time. Having said that, some have reported that their AirPods have survived washing machine cycles and dunkings in pools. This obviously isn’t recommended and they are NOT waterproof, though Apple has probably made them unofficially sealed to prevent any issues with being worn in the rain. 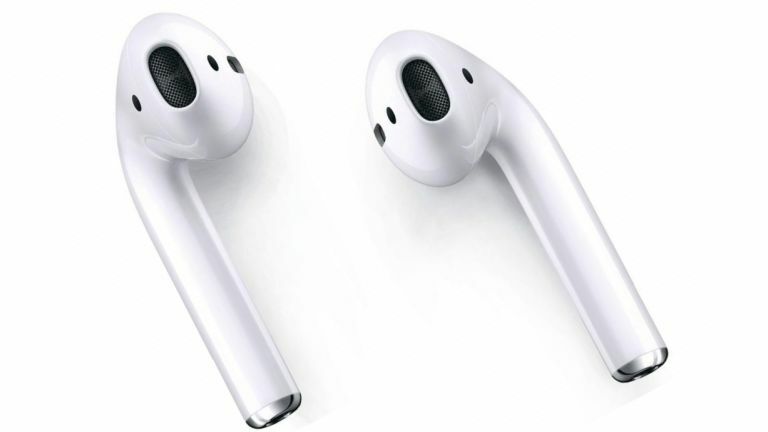 The AirPods feature beamforming microphones, optical sensors and motion accelerometers. Removing an AirPod also pauses the music, as long as you leave automatic ear detection. You can, of course, choose for there to be no action when an AirPod is removed from the ear. The only time this is frustrating is when you’re switching from two to one AirPod. We’d like an option to only pause the music when you remove two in quick succession. The functionality is OK as it is, though. As we mentioned before, you can use one AirPod as a 21st century Bluetooth earpiece – handy in the car – and by default the microphone will switch to the AirPod you still have in. You are able to change the preferred mic to be one or the other. The mics are designed to filter out other sounds to focus on your voice. We’ve seen some comments about the microphone performance in noisier environments (like on the street) but we actually haven’t had a problem with that at all. One of the biggest drawbacks is that they are quite easy to lose, both in the case and without (the case could definitely do with being a LOT more friction-generating in some way). They’re also quite droppable and yes, we have been an idiot and dropped one of them near - though thankfully not in - a drain. Apple can’t account for the actions of the people that use its stuff (especially yours truly). So what do we think of Apple's latest creation? In short, we love the AirPods. They are technically brilliant and we're big fans of how well they work with iOS (we wouldn't bother if you use Android). The sound quality is also superb. However, there is one big drawback and that's their appearance. But as a first stab at a wireless earphone, we have to say that Apple has done remarkably well and compared to competitors like the Bragi Dash, they're reasonably well-priced, too.